The eight secret agents (Arie Kriting, Babe Cabiita, Bintang Bete, Ernest Prakasa, Fico Fachriza, Ge Pamungkas, Kemal Palevi, Mongol) who adopted the code name COMIC 8 are back in action. They are led into a trap by THE KING (Sophia Latjuba) and her army, led by Isa (Donny Alamsyah) and Bella (Hannah Al Rashid), and a co-conspirator named Dr. Pandji (Pandji Pragiwaksono). Our secret agents must bet on their lives in the world’s largest online gambling scheme whose players include renowned gamblers from around the globe. The eight of them must get through each life-threatening level together, facing a killer squad called The Hunters (Barry Prima, George Rudy, Lidya Kandou, Willy Dozan, Soleh Solihun, Sacha Stevenson) who keeps on hunting them to end their lives. They also have to face the Master of Martial Arts, The Ghost (Yayan Ruhian), who resurfaced back into the world simply to eliminate Babe Cabiita. At the same time, Indro Warkop, who is wanted by an Interpol Agent named Chintya (Prisia Nasution) is also trapped in the Online Gambling scheme on the hidden island with a Security Guard (Ence Bagus) who appears in the wrong time and place. 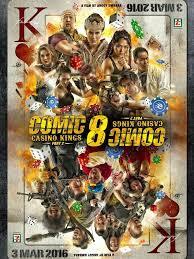 This sequel, Comic 8: “Casino Kings Part 2” will blow your mind. Making their memorable cameos in the action-packed, laugh-out-loud film are Nikita Mirzani, Agung Hercules, Agus Kuncoro, Candil, Gandhi Fernando, Cak Lontong, Joe P Project, Boy William, Ray Sahetapy and Bagus Netral.